Q: In order to create dreads, at the least, how long does my actual hair have to be? It actually differs individually, but it can be said that at the least three inches (approximately eight centimeters) are needed. It also depends on the style of dreadlocks you are aspiring for. Q: What are the different methods offered at Taka Hair Salon to create dreadlocks? At Taka Hair Salon, we offer methods such as: dread perm, natural dreads, and dread extensions. Natural dread is a procedure in which no chemicals are added, and the hair is locked as it is backcombed using beeswax especially made for dreadlocks. This type is not available for those with thick, straight hair (i.e. Asian hair). Dread perm is a procedure in which the perm is applied to the hair to create dreads. Clients with straight and/or Asian-like hair that desire to have a look like Bob Marley’s will begin this procedure by first applying the dread perm to create the locks. 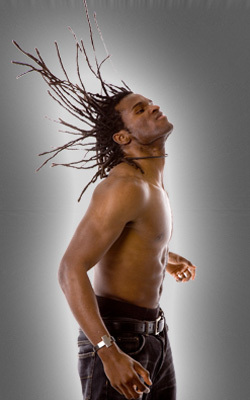 We also offer cool, unique dread styles that only perms can create. For more information, please come in for a consultation. 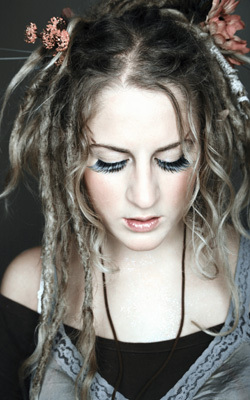 Dread extension is a procedure using extensions (hair pieces) to create the dreads. This way, we can make your hair longer if you prefer. The time length of the service depends on the hair length, as well as the dread type, but the rough estimate is about two to five hours for the natural dread, three to five hours for dread perm, and if natural dreads are desired after the perm, about another additional two to five hours. Q: Will my hair grow even when the dreads are made? Yes, it will continue to grow. Q: If I wanted to take out my dreadlocks, it the only way to cut the dreaded part of my hair? Cutting them off is the fastest and easiest, but in most cases, with the use of the exclusive dread remover, it is possible to take out the dreads without cutting off your hair. Q: How long do dreadlocks last? Natural dreads are permanent in that once the dreads are made, that section will have dreads until the roots begin to grow. Once the roots grow and you wish to maintain the dreads, apply the Knotty Boy wax only to the roots, and twist. Although it depends on your hair type and maintenance, in most cases, the dreads will continue to take on the shape without having to come back to the salon. Use the Knotty Boy Tightening Gel to create a clean, tight look. To create a moistened look for old dreads, use the Knotty Boy Conditioning Spray (all products can be purchased here at Taka Hair Salon). Although results may vary individually, dread perms usually last three to six months. Once the roots begin to grow, it is possible to get the dread perm. Q: Will I be able to wash my hair? If so, how often should I wash my dreadlocks? Yes; no problem! Once the dreads are firmly set, wash your hair roughly once a week. Those that are concerned about the itchiness and buildup should wash their hair about once in three days. It is possible to wash your hair everyday with the exclusive shampoo sold at Taka Hair Salon. Q: Should I use a specific shampoo made for dreadlocks? Yes, at Taka Hair Salon we proudly carry 100% natural ingredients from the Knotty Boy line. The shampoo is exclusively made for people with dreadlocks, and allows for easy maintenance, refreshment, as well as being very calming to the scalp. Q: What should I do when my hair gets very itchy and I start to get flakes? First of all, the most important thing is to be aware of maintaining a clean scalp. When grime is left in the hair, unnecessary oil can accumulate in the scalp, in which case bacteria such as lice can reproduce within the dreadlocks. Also, shampoo regularly as needed to avoid itchiness and flakes. The Knotty Boy Peppermint Cooling Spray can also soothe away the itch (all products can be purchased here at Taka Hair Salon). Q: How should I maintain my look? Natural dreads take time for the dreads to completely lock and set in place. Maintain cleanliness by removing grime from the scalp with regular shampoo, conditioning, and tightening. By tightening the roots and disentangled ends with wax, and further tightening them with the tightening gel at home can lead to firmer and tighter dreadlocks. Dread perms depend on the hair type and method type, but it’s safe to say that shampooing should be okay after about a week since the perm was applied. The perm will be beautifully maintained if the wax (selected exclusively for you by the stylist) is used at the ideal ratio: everyday for the first two weeks; every other day for the third and fourth week; and once or twice a week for the fifth week. Also, make it a routine to apply the designated wax before you wash your hair, then shampoo, and apply wax after towel-drying. Q: Should I book an appointment? Yes, we strongly recommend to book an appointment; because dread service can take a long time, we may not have a time slot available for walk-in clients on that day. We also recommend our clients to come in for a consultation before the actual appointment to discuss about prices, service time, and other specifics with the stylist.